I had thought that last year’s vigorous local residents protest had at least placed the project under a moratorium but now understand that the application will go before the KCC Planning Committee on the 14th February. – The Hitchhikers Guide to the Galaxy. So here’s a new thread for all of you who may wish to expand this subject further today. A lovely photograph Dr Moores. My understanding is that Ursuline plan to put a big barn up(Sportshall) centred on the concrete you can just see in the pic and on the orchard leading up to that huge block built a few years ago. Its interesting that your pic shows the field to the left of that orchard that butts on to bungalows in Ursuline Drive? I think that this was where they wanted houses to be built after selling to pay for Ethelberts big barn (Sportshall). Why cant they all agree to one shred Sportshall? Rumour in Westgate is that the prime agricultural land on the South side of Canterbury Road between Ethelberts and the start of Birchington has been left fallow by Liningtons the farmers because its going to become playing fields. Does anyone know if this is true? I ask this because as we can see from the lovely picture that there is plenty of underused playing fields between the two schools. Why cant KCC get both schools to use what we taxpayers are already paying for in a coordinated joint use way? Why 2 Sportshalls in spitting distance of each other and why use open space agricultural land when there is more than enough space already? Green sites with trees and open spaces are at a premium in Thanet and should be preserved. TDC refused the application on December 14th on the basis of its being within the Green Wedge (proposed and seconded by Cllrs Ward and S Tomlinson respectively). But because this is a case for KCC, its not so much a refusal as an objection. I cant seem to get on the KCC Planning application site so Ive sent an email to KCC asking for them to send me a copy of the report which will come before Planning next week. On being granted specialist status, schools get given a large sum of money for a capital project, in this case a new sports hall. Having applied for specialist status two years ago, you really would have thought that someone might have considered the planning aspect first, and perhaps got outline permission, before getting status and then hoping for the best!! Oh well, thats education for you! James,glad it wasn't my finger trouble in trying to access KCC. Anything you get back from KCC will be of iterest. Is it too late to register objections? What's the latest state of play with the Pleasurama development? When's our arsonized library going to be re-built? And can anyone tell me why they've only partially re-built the Granville, and what they're going to do with the wasteland behind it? I can't find plans or permissions, or even the developers, anywhere on the internet. Also, our local councillor, Dave Green, refers to the 'Ramsgate Renaissance' plan in his Eastcliff Matters blog, but I can't find that on the internet either. I remember from the glance at the report there was something in the region of 33 objections from local residents. Its probably too late for registering objections but there is the possibility of direct lobbying of the members on the Planning Committee and registering your concerns to them. That way even if it doesnt get put in the report, they will still know your concerns. I cant see a problem with that as long as its done reasonably and with respect that they have a choice to make. Sorry, Ramsgate Surfer. Im from Margate and have been to Ramsgate once in 3 years. Ive never heard of that before but Ill have a look for it later on today. Cross your fingers on this one. Your best bet is to contact Cllr Green and he'll know which person to aim the questions at (probably Cllr John Kirby or Cllr Ezekiel). A nice picture of my daughters school, thankyou. Facilities for sport are almost non-existent at the Ursuline College and they desperately need a Sports Hall. I hadn't realised they were having problems with planning. It might explain why some of my daughters friends(in yr 11) think it will not be built in their time as we were told by their Director of Sport, Mr Davey that it would be built last year! Why couldn't this all be sorted out between Ethelberts, Ursuline and KCC as this end of Thanet is crying out for facilities for youngsters? Still nothing from Ramsgate, then! Ill send an email shortly to the TDC Planning Department about the Ramsgate seafront situation. If I remember the last I heard about changes to it were that the height of the buildings was being reduced slightly. Ill get back to you on this site when I have something more solid to report. James, welldone! You must have stirred up KCC as www.appps.kent.gov.uk/cs/planapps/pdf/item_D1_-_Ursuline_Sports_Hall.pdf has now come up with the goods. I am not familiar with the planning situation but it seems that on 14th Feb KCC has to decide to send it to 1st Secretary of State. If the recommendation in the report is accepted and KCC send it off to Sec of State, is there further consultation with us locals? What I find amazing is that there is no reference to Ethelberts schemes for their industrial shed sorry sports hall and linkage between the 2 schools. Surely this is relevant or is it a case of a race by the two schools and whoever gets in first gets theirs built and the loser cant build? Shame no-one from round here could get their act together on this. Gone skiing, Dave? The development agreement is with the lawyers at the moment. The reduction in height that I and others have been insisting on has been agreed. The question of the roof landscaping is still under discussion. Officers have assured me, and a public meeting I arranged, that building will not start until they are satisfied, and that they won’t be satisfied without consulting. Plans are in final stages, aim is to go for Planning and listed building consent this month or early march. Plans do not include replacing the Museum and Gallery. Good to see the application is now up. Funnilly enough a copy of the right planning application has just dropped into my inbox. Theyve promised to send me a copy of the actual plans when they are ready. Along with that were the minutes from the Site Visit, which do answer some questions. Credit goes to Andrew Tait of KCC whos clearly gone out of his way being extremely efficient with responding. I dont think there will be anymore consultation. This will be for decision. The Secretary of State has to check out these plans as they are a departure from the Development Plan. Its procedure, basically. One question was about why there has to be separate sports halls. It appears attempts to get joint funding failed. Theyve tried for 3 years to work with King Ethelberts over this but to no avail. The project will cost a million pounds but without the new sports hall the College might not be able to fulfil its role as a Specialist School. Its dimensions will be 10m high by 40m in length and 38 metres wide, located on top of the orchard and a small area of the external sports courts. Therefore the fruit trees within the orchard will have to go and the wall between the two demolished. Ill be able to confirm that when I receive the plans. As for Ramsgate, a quick search of Google comes up with parts from the Local Plan but nothing much more substantial at the moment. Will report back if I find anything. 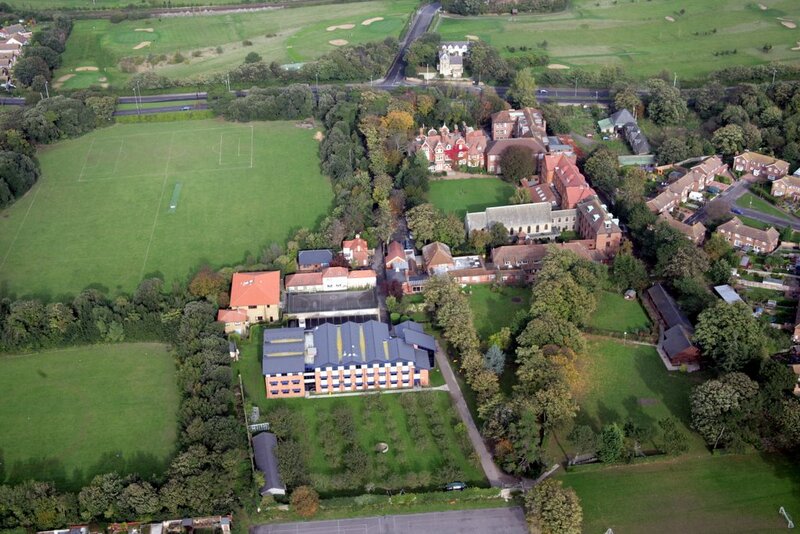 In May 1999, permission was granted for a new teaching block, St Ursula’s which allowed expansion. A planning condition was attached which required a dedicated right turn lane into the college from the A28. This was never done, but County allowed the new build to be used anyway. On safety grounds this needs to be done. The current application is for a two storey, 6 badminton court sports hall and climbing wall, 28 by 40.2 m , 10m high at the ridge. The schools argument is that, as a specialist sports college, it needs the facility to meet curriculum requirements and to provide a facility for surrounding schools. It offers to be a regional centre and a hub for the Thanet Schools Sports partnership. It is intended to use the facility 9an to 9pm together with the 90 parking space s on the schools grounds. The local county member, Mr Robert Burgess was notified on the 25th October 2005. Parking restricted to the school site. County Officers are recommending permission be granted. The plans have been posted on the Kent Planning Applications site now. The link below will take you right through to all documents relating to the application. I've just had a word with the KCC planning office on this subject and strongly recommended that before anyone takes any decisions, they should, in the interests of local democracy (an oxymoron I fear) read through the opinions and information reflected in the comment threads here. DG - thanks for the info on the Ramsgate stuff. I appreciate not everybody has the time to just sit and log onto blogs, so I take back that jibe about the skiing (unless you're contributing on your Blackberry from Val d'Isere, that is!). I presume I can find some or all of it on the net so I'll go away and investigate. Mary Green's planning report raises some interesting issues. 1. There is no problem regards the orchard. That is because the college cut down the one oak tree in the orchard prior to submitting the application. This because of tree preservation problems encountered by them in 1999! The matter was reported to the Thanet DC tree officer, but with no response or action at the time! Poor little oak! Another victim of progress! 2. The rear entrance from Linksfield Road. This access has been used by pupils for the last year, and causes terrible problems at pick up time in the afternoon. The sports hall will increase the pupil useage, and parental parking, in what is a narrow road. It does not matter to KCC apparantly that buses and emergency vehicles will not get past the cars waiting for children! 3. It is a building for the use of other schools and clubs, and the community. This is the same excuse for the sports hall being built at King Ethelberts. I know we are unfit, but do we really need two almost identical sports hall, less than 400 metres apart! One or the other but not both for goodness sake! I live in a rural street that will soon resemble an industrial park! 4. The Ursuline college is a specialist sports college and needs the hall. It has not got sports fields or a proper hall. Why on earth did they then want to become a sports college? In 1999 they built a brand new technology complex! Technology status perhaps? No too simple! This may sound jaded and fed up. That is because my house value has gone down due to these two lumps being built. Thank you TDC and KCC! Fed Up, Linksfield Road, Westgate!!! Thank you Cllr Green for the precis of KCCs planning site. Am I right in thinking that me and my neighbours in Ursuline drive and Linksfield can still raise this issue at KCCs Planning Committee on Tuesday 14 January when it comes up for approval? Who can actually adress the Committe? Does local democracy mean we can have our say at Maidstone? Does anyone know how to go about it and any reasons why we cant? I'm a bit hazy over KCC procedures, I'm sure if you ring the Case officer Mary Green 01622 221066, she can tell you. I think residents can speak. I think its 14th Feb. Thanet has two Labour members on the planning committee Clls Clive Hart and Elizabeth Green. (01843 591495) I'm sure they would help if they can? Explains public speaking at planning committee. Thank you Cllr Green and James. A great help. But I can't find it on the planning website. When was it granted? And isn't the 'West elevation' the bit that has recently been built? And do you know anything about Oakleigh Devlopments? There's scant info about them on the web, they don't even have their own site. Cllr Burgess has replied on the other thread, change of view. Whilst sounding interested, he has of course missed the point completely. If you read the two threads, then you will understand the concerns. The access from Linksfield Road is already causing problems. The school have started using it this year, to get people used to it. It will get worse, and it will eventually lead to emergency vehicles not gettting to where they should. Do people need to die to make the point? At present this is a problem when the school opens, and closes. Now make that all days and weekends!!! There is an orchard. There was also an oak tree cut down by the school! No coment on this one councillor? Is this because the matter was reported to TDC and nothing happened?? Of course it would be better to have a joint hall in the shielded area between the two schools. But, I presume that the usual council excuse, TDC and KCC will be, that they are seperate applications and considered seperately! KCC and TDC are being lied to by the school. But of course, they don't live here!! !